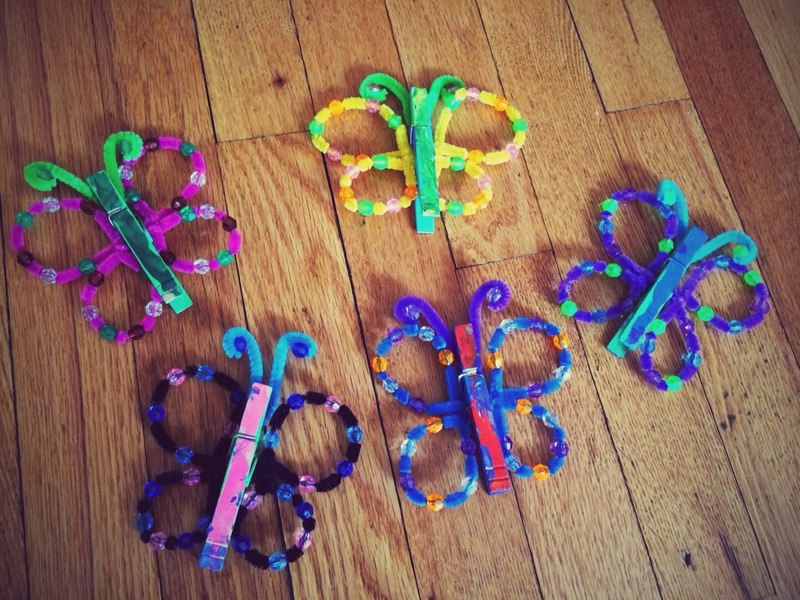 These clothespin butterflies are fun to make and can be clipped just about anywhere! 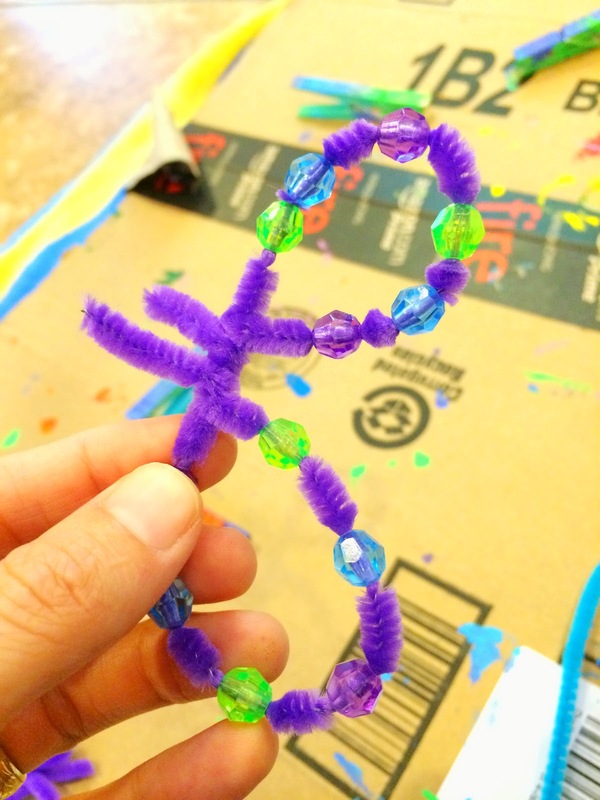 L and I started this craft on a whim a couple weeks ago, we were trying to make butterflies with things we already had. Hopefully you have all the materials hiding around your house too! 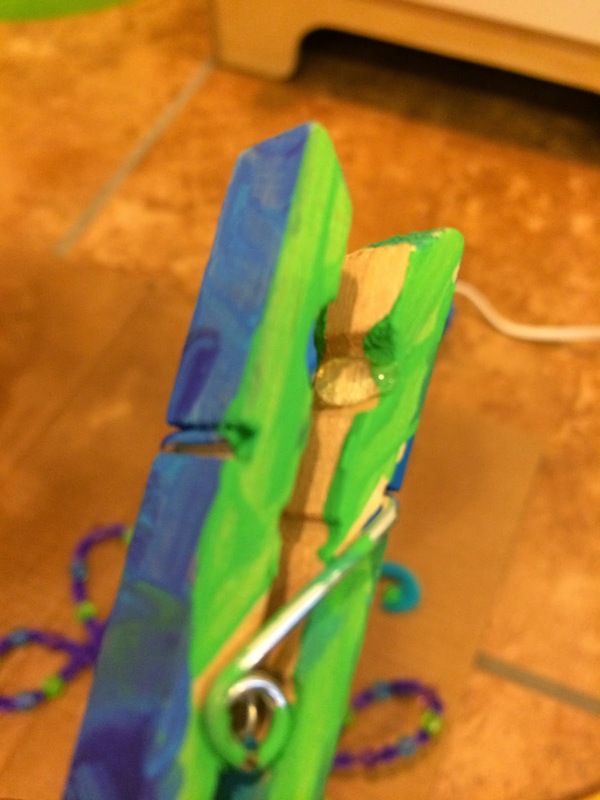 You could use paint or markers to color the clothespins. Using markers, the butterflies could be finished in one morning. We chose to paint ours...L loves to paint and I like when projects can be stretched out, keeping us busy for a few days. 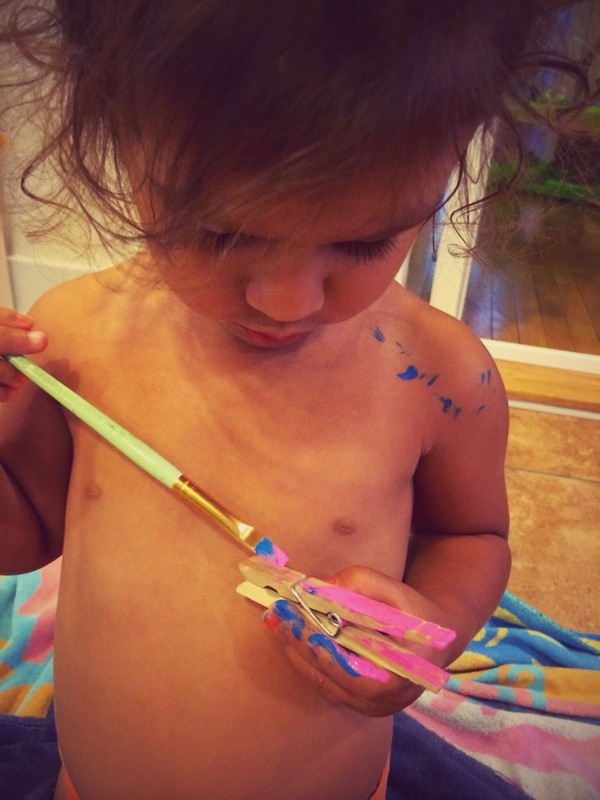 First, paint the clothespins. We painted one side, let them dry, then painted the other. I helped with the touch-ups...filling in any little spots that were missed. Let the kids have fun with it! 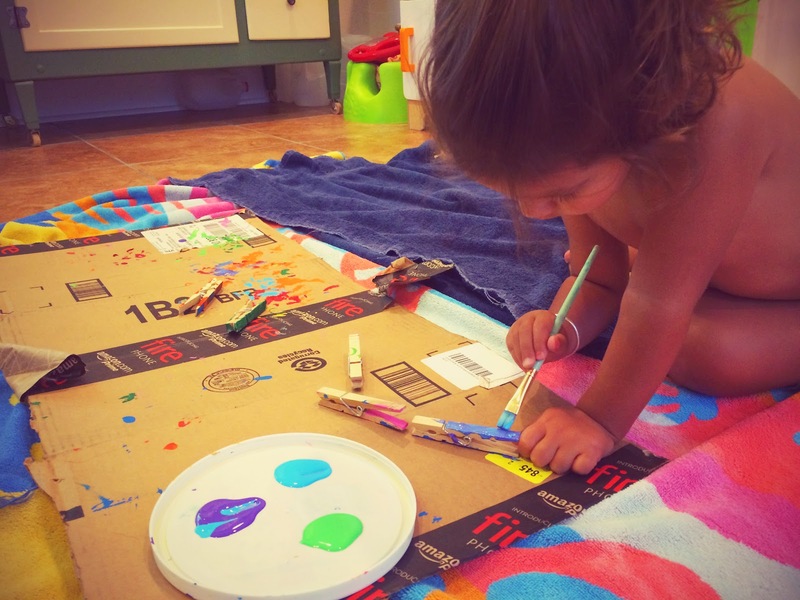 L was happy painting hers all sorts of colors...there's no right or wrong way. 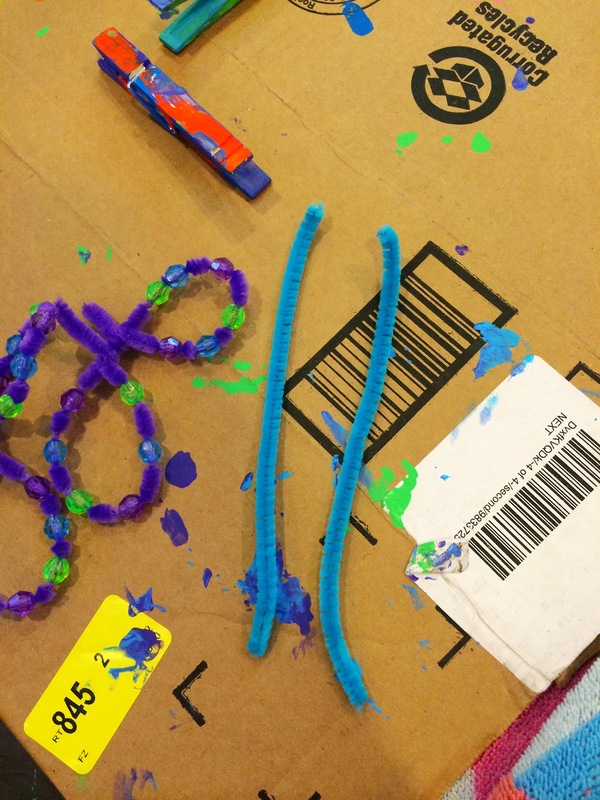 Next, choose the color pipe cleaners you want to use for wings and the color beads. 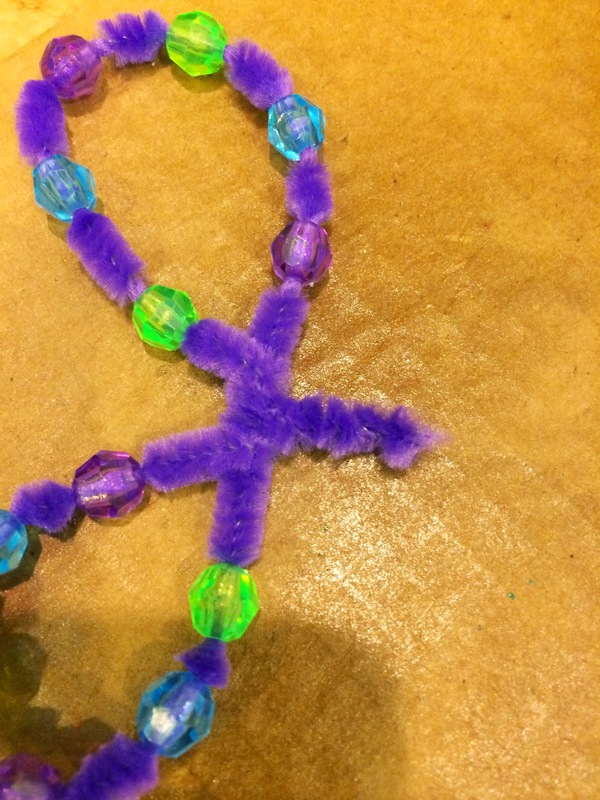 We used three colors of beads for the wings. 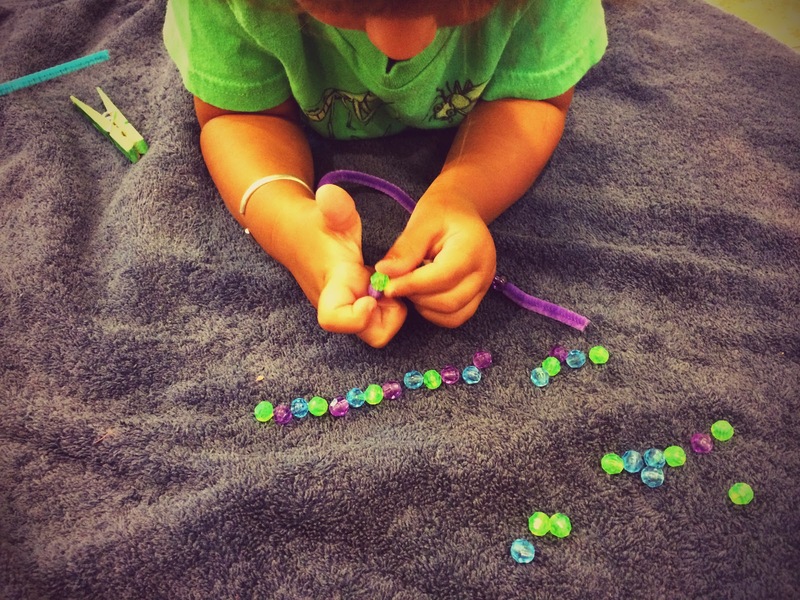 This was a great learning activity to teach little ones about patterns! 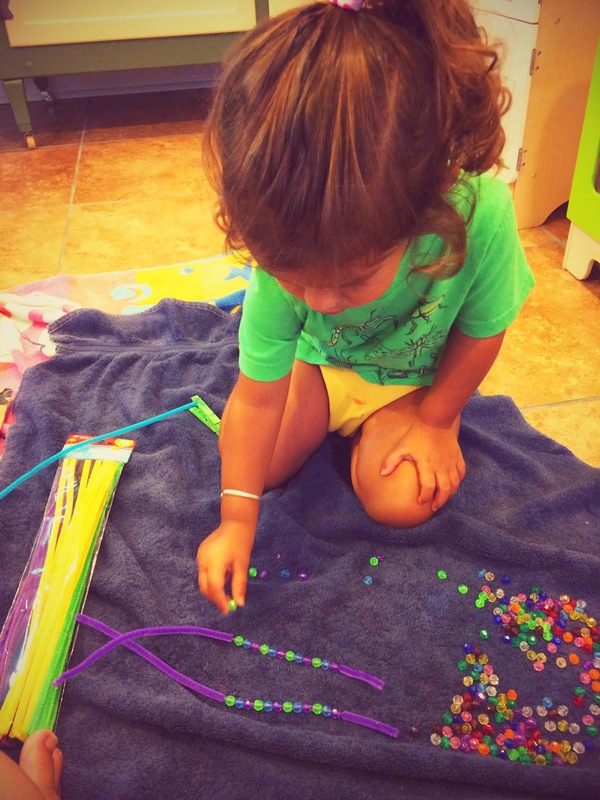 L strung the beads on the pipe cleaners, repeating our 3-bead pattern 4 times for each wing. 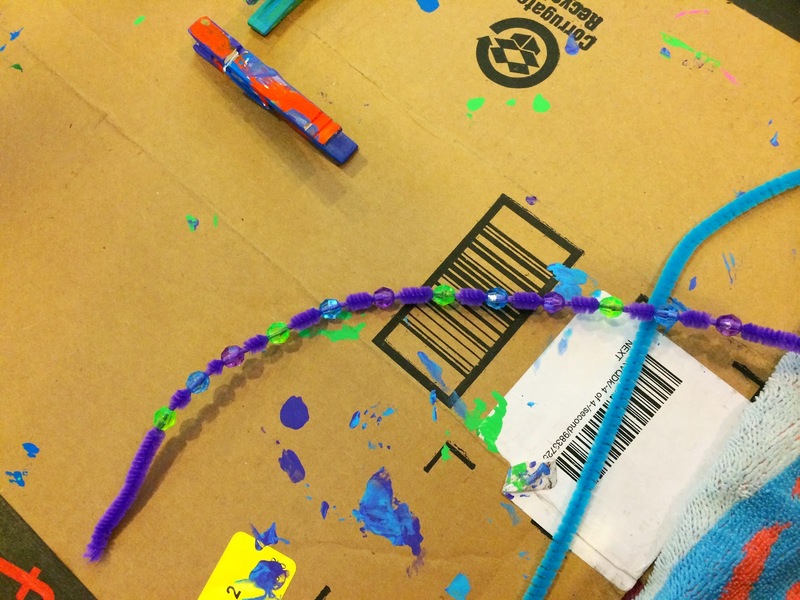 Spread the beads out a little bit, so the color of the pipe-cleaner can be seen. 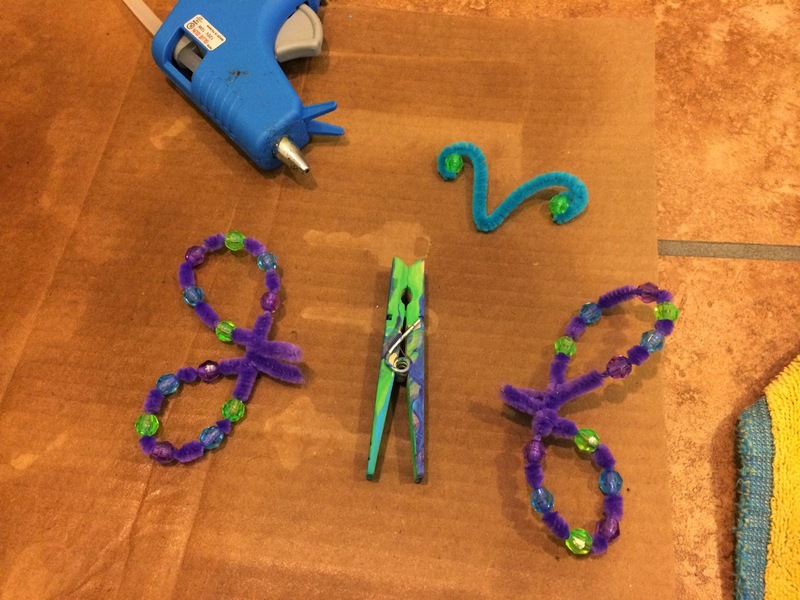 Next, loop one end of the pipe cleaner around to the middle of the pipe cleaner and wrap it once or twice, leaving about half an inch of the end sticking out. 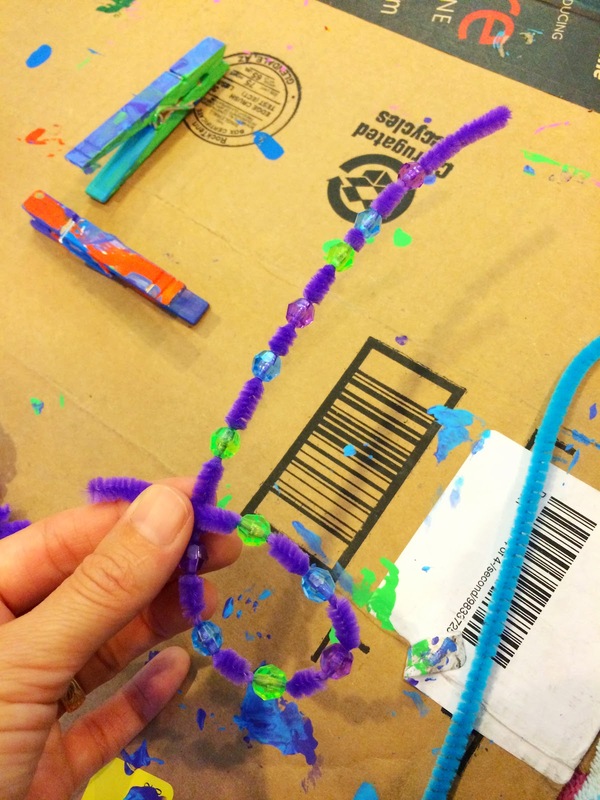 Repeat with the other side of the pipe cleaner, forming a figure-8 butterfly wing shape. 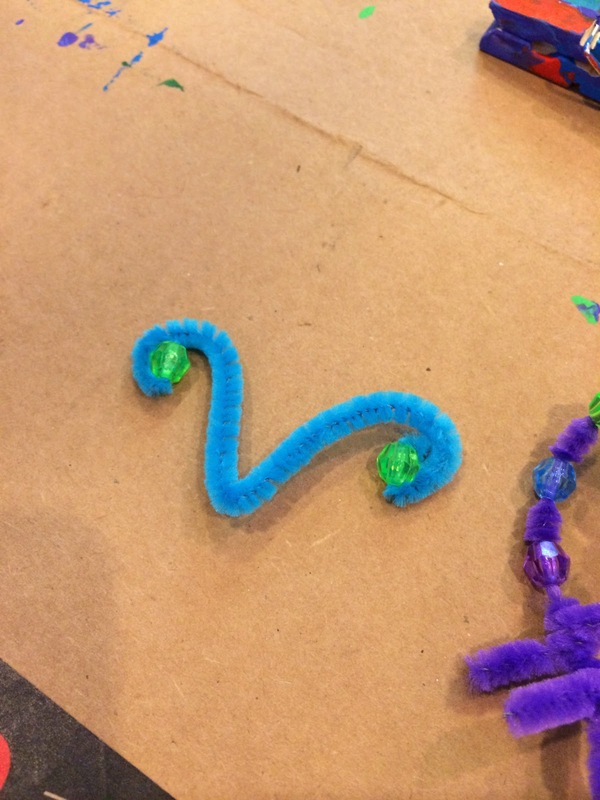 Twist both half-inch ends together. (This step is much easier to see in the pictures than to explain!) Repeat for the second wing. 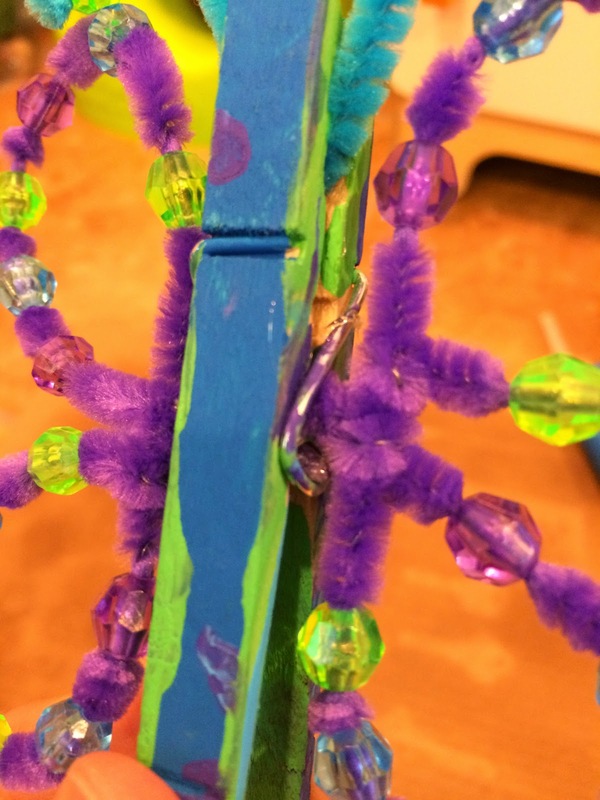 To make the butterfly's antennas, cut a pipe cleaner in half. Then, bend that piece in half. 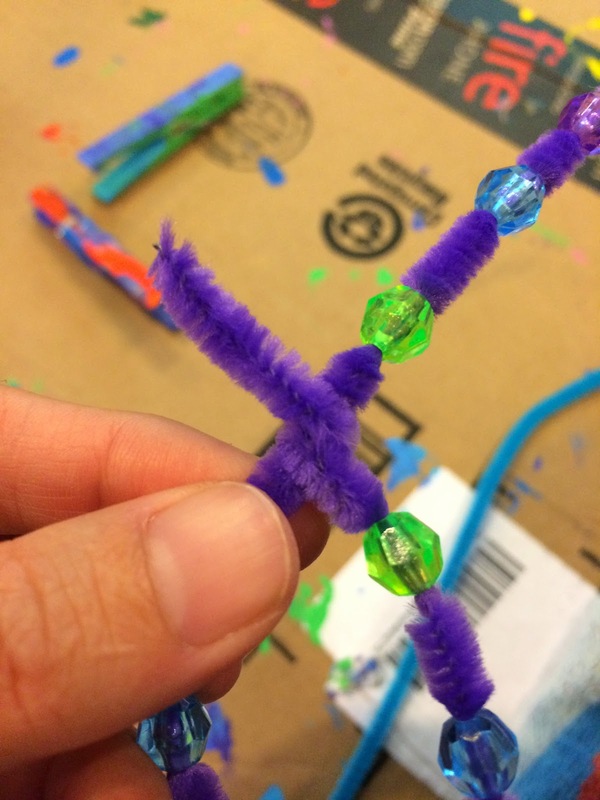 Put a bead on each end of the antenna and curl it down a bit. 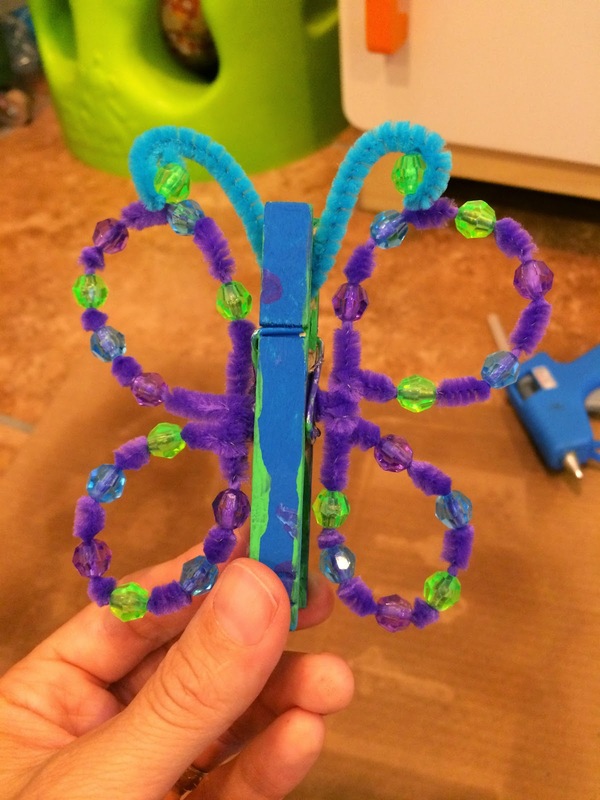 After you've shaped both butterfly wings and the antennas, it's time to glue them to the clothespin. 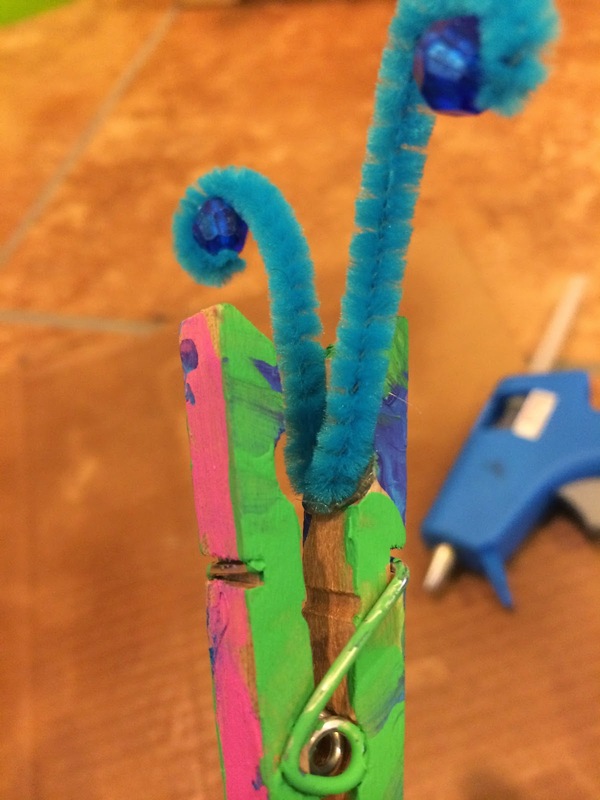 Using the hot glue gun, put a little bit of glue on the inside ridge of the clip and quickly press the middle of the antennas in place. Next, put a bit of glue inside the wire coil and push one of the wings in. Repeat the same on the other side, only put the glue above the wire coil and slide the wing in place. Cute, right? These would be beautiful hanging in a window with the sun lighting-up the beads! 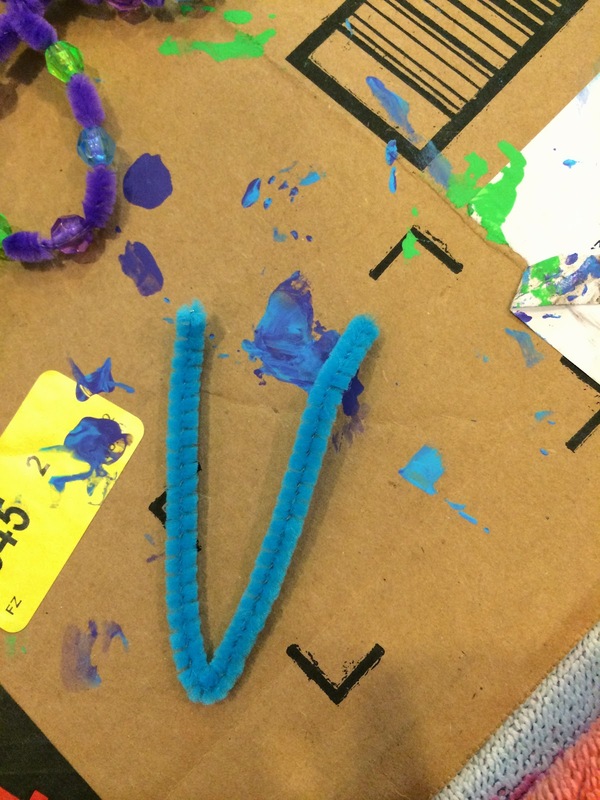 We're making something special for WB's room with ours...I can't wait to show you next week! Enjoy!